This is a moving, thought provoking spoken word and poetry address, given in honor of the U’wa and their resistance to oil drilling on their ancestral land in Columbia.John Trudell was a poet, musician, and an advocate for Native American rights. He did not set out to be a writer. His poetic gift developed out of the remarkable, sometimes horrifying circumstances of his life. 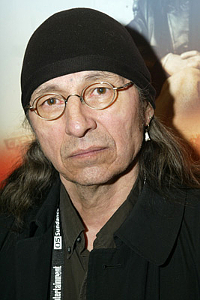 In 1979 that war took a terrible personal toll on John Trudell. On February 11, he led a march to the FBI headquarters in Washington D.C. Approximately 12 hours later, in the early morning hours, a fire “of suspicious origin” burned down Trudell’s home on the Shoshone Paiute reservation in Nevada, killing his wife Tina, their three children, and Tina’s mother. Devastated by the loss of his family, Trudell withdrew from the world; “writing words” became his way “to keep some sanity” and continue to survive. An essential point to keep in mind is that this expression comes from the oral tradition. The written word is different. The spoken word transmits awareness and understanding in a more comprehensive and integrated form. While the transcript is available, the most thorough way of taking this in is to listen. … the being part of human is being mined through the logic of the human, alright, and the emotions of the human. The being of spirit, the spirit of being is what is being mined through the logics and emotions of the human, in order to run this system, see. I mean this is the purpose of techno-logic civilization. They call it techno-logic for a very specific reason. This isn’t an accident, okay? You know, it truly isn’t. But the purpose of the civiliz[ation] – and so one of the civilizing processes is to erase memories. Alright?, to erase memories. Because we have ancestral memory. It’s encoded in the DNA – it’s a genetic memory. You look at how techno-logic civilization – and everywhere that it goes, the longer it’s there, the more isolated the human beings – but they’re not called human beings, they’re workers and citizens, etc., alright? Alright? But the more isolated they feel, they no longer – you know, maybe they remember their grandparents or their great grandparents. But see, you’ve got all that ancestral knowledge that’s encoded in the DNA, but it’s been cut off. So it can’t activate because if we’re not conscious that it’s there then we can’t – it just makes [things] difficult. See this is the memory that it’s very important for them to erase. Alright, and it’s about who we are – it’s memory of identity and self-reality. So anyway, we, because we are, we come from where we come from, every one of us is the descendant of a tribe. Every person in this room is a descendant of a tribe at some point in our ancestral evolution. Common, collective, genetic memory that’s in there, you know, that’s encoded, like I say, in the DNA. And for every individual, encoded in our individual DNA, alright?, is the experience of our lineage from the very beginning. Whose whole perceptional reality was what I was just saying: all things have being, we’re made up of the Earth – all my relations, pray to spirits. See, and they didn’t pray to man or human form. The closest they came to it was they prayed to spirits that were called ancestors. Alright? And because they were praying to those ancestors for help and guidance, they understood that we were borrowing today from the past and the future. We’re borrowing it from both places. So they had this understanding of reality. So they knew that to keep the balance was the purpose. That was the purpose. The reason for being was to keep the balance. So this was like, you know, what I will call a spiritual perception of reality. And so because of the spiritual perception of reality they understood that life was about responsibility. It wasn’t about the abstraction of freedom – it was about responsibility. That life was about responsibility. So the spiritual perception of reality was based upon that: we were the Children of the Earth, the Earth was our Mother. The Sky, the Sun and the Sky – these were our fathers. Alright, but this was – and our reality worked for us…. So in our collective, genetic, ancestral memory, we had the experience of encountering the techno-logic perceptional reality. Because somewhere as this thing unfolded and refined itself, as it was spreading over the planet, a religious perceptional reality was used to replace a spiritual perceptional reality. Alright? And so anyway, in order to be – justify being here – to get to stay [laughter] – you had to submit to the male dominator chain of command, the authoritarian system. See, in this new religious reality[, it] said that, you know, well now there’s one god. The gods battled it out amongst themselves, see. See I can’t envision, to me I’ve never been able to envision gods or goddesses. I can’t imagine the Creator in a human form. I mean no – you know, I can’t. And I think our road, our path to trouble started when we started to do it that way. Alright, you know, looking at the Earth as the Mother and these things, you know, call it a goddess, whatever, and this and that. See, but I don’t go with god because I know that’s a limited perceptional reality. See, they forced it on us. But the trouble came see, when, when we decided that the Creator entity had a human form. See because then, that, that rationalized and justified mistreating the rest of the natural world. Alright? I mean, sexism and racism came out of this perceptional change because once the Earth – you know under the new god thing, see, the Earth was no longer the Mother. The Earth was the property of this new god. And all god’s children – see god didn’t have a lot then, but they were very mean [laughter] so their numbers expanded through terror – see but god’s children was the – their job and objective was to subdue the Earth for this god. So in order to achieve that objective they had to create sexism. See, sexism has got to do with how we live with the Earth. And racism, because now that the Earth was property, you know and all spiritual value was away, was away from the Earth, you know. Real spiritual value was now a religious perceptional thing, and, right, so it wasn’t all encompassing, it wasn’t just a part of the reality anymore. So not a one of our people really went for this. Because it’s like, you know this is a major perceptional reality change. But anyway we committed a moral crime forgetting here, so now we had to submit to that world view. To me, coherently to me, it’s clearly a blatant, a blatant, a very blatant perceptional altering how one perceives reality. I mean it’s brainwashing intensified at its maximum, right? Because our ancestors were forced to see life differently in order to remain just physically alive…. Alright – we know there was an inquisition. And this inquisition went on for 4 or 500 years in Europe. The purpose of the inquisition was to alter the perceptional reality of the descendants of the tribes of Europe. To make them believe and see reality the way the church wanted them to believe and see reality. The church called it – they waged a war for possession – for possession, this is important – they waged a war for the possession of the souls of the godless heathens. And to be a godless heathen you just didn’t believe in god. It wasn’t a part of your reality. Or another way [of] becoming a godless heathen was to question the authority of the church to do this. See now, again, I’m not making this up. You know, this did transpire. These things did happen. And they killed as many people as they could – I guarantee it – in order to get the other ones to submit. So they killed as efficiently as they could with the technology they had at their disposal at that time, alright? And because they created a rationalization as to why to do it, so it just became as efficient as they could do. And at some point, the descendants of the tribes of Europe no longer knew what it meant to be a human being. They just didn’t know – they didn’t want to know. So the descendants of the tribes of Europe, in the end, had to love what they feared which was there to possess them. See, and I think it messed up love in a lot of ways, you know that they haven’t unsorted yet. You know, no offense, but ….. But anyway, all of this took place through our intelligence. Our intelligence. Now whoever it is we pray to, right?, whoever it is we pray to, however we pray, whatever, however we do that, alright?, I think that we have an obligation and a responsibility and it’s about respect. If we respect our Creator, then we should use our intelligence as intelligently as we can as often as we can. And that means with clarity and coherence. That means to activate and respect our intelligence and activate the thinking process so that it’s going the way we want it to be because that’s why it was given to us. Our intelligence – as the human being part of all of this reality that’s going on, we were given intelligence, this is what was there to help us through the evolutionary reality – to ride the balance, so to speak, of the evolution with our intelligence. It’s our medicine, it’s our protection, it’s our self-defense. Those fears and doubts and insecurity in one’s daily mind and reality – how much do they affect one’s daily mind and reality? How much do they affect the ones of the people around them that they’re connected to and that they care about? What’s the repercussions of the fears and the doubts and insecurity? Because I guarantee you, every day when we get up, we use our intelligence to create those effects. So it isn’t that we’re not using our intelligence, or we can’t use our intelligence – we can’t stop using our intelligence. But it’s about as human beings, taking the responsibility to be as clear as one possibly can be about it and use our intelligence the way our Creator gave it to us to use. Keep the balance, our intelligence. So this is – everything that ever happened – had, to change the perceptional reality, this – the battle ground had to take place. The real battle ground may have been the bleeding and the dying, but it has to do with the intelligence, to alter the perceptional reality…. But if we would look at ourselves clearly, the Dineh, the Navaho have a way of saying, I’m going to the fourth mind. Which means to look at everything. But you, you rise out of it. You look at it from outside, from the top, the bottom, all the way around, from the inside. You look at it from under it. You look at it, that that thing for it – every way that you can and you see it for what it is. And then you, you act…. The first act, the first act of being free and liberation, alright?, is the act of taking our intelligence back, taking our imagination back, our ability to think. That’s the first act of liberation. That is the very first act, alright?, of conscious liberation. The first steps towards respect for the Creator is understanding that we have that intelligence and doing the second act. It’s our intelligence. And for our next generation, you know, we have a responsibility to direct as much intelligence into that as we can. Because this thing about life and death – you know, this techno-logic reality has been around for 3 or 4,000 years – I don’t know however long it’s been around, you know. But its whole reality is based upon death so therefore, at some point it must die. Our whole objective as human beings is to stay alive. Do you get it? I mean really alive. Not surviving and existing, I’m talking about alive. Connected to life and living. See, we have to outlast it because we can’t outfight it because its violence and its aggressive mindset, alright?, is beyond parallel. But that doesn’t mean that it’s powerful. That just means that it’s violent and it’s aggressive and it’s without parallel and you better be damned careful of it. But that’s what that means, about power – our relationship to clarity and coherency and the use of our intelligence is our relationship to power and we can outthink it…. Your descendants and my descendants depend upon us, alright?, to keep the reality of the living alive. And we are going to influence the outcome, no matter what we do. So [what] I’m talking about is, well let’s take some responsibility, alright?, and let’s influence it in a more clear and coherent way. Outthink them. Trust ourselves and our ability to think. And each and every one of us was given just as much intelligence as we need. It’s not a contest.